Because connecting to VPN doesn't actually mean your PC is not leaking the DNS info to your ISP. With ever growing valuable personal data collection by even the biggest tech giants like Google, Facebook, Microsoft, etc., it is imperative to safeguard your internet privacy. ISPs also can record your internet usage details. Thankfully, VPN service costs have come down significantly and so subscribing to a decent service like NordVPN, ExpressVPN, CyberGhost, etc. has become reasonably affordable. These top VPN companies are rock solid, trustworthy, and provide end-to-end encryption. Your privacy is secured if you choose an excellent VPN service. Unfortunately, there is a bigger hidden problem even when you are using a good service. It’s the DNS leak. No matter which VPN service you are using, if you are using OpenVPN to connect to your VPN service, chances are that your PC is already revealing your actual IP address due to improper network configuration. CAUTION: Please don’t rush through the article, and follow the article at your own risk. Read the article in its entirety, and follow the steps carefully. The tutorial worked 100% on our test computer and several users have responded positively. There are also users for whom the guide didn’t work due to varying network settings between the systems. Uninstalling resolvconf completely should solve the problem for them. 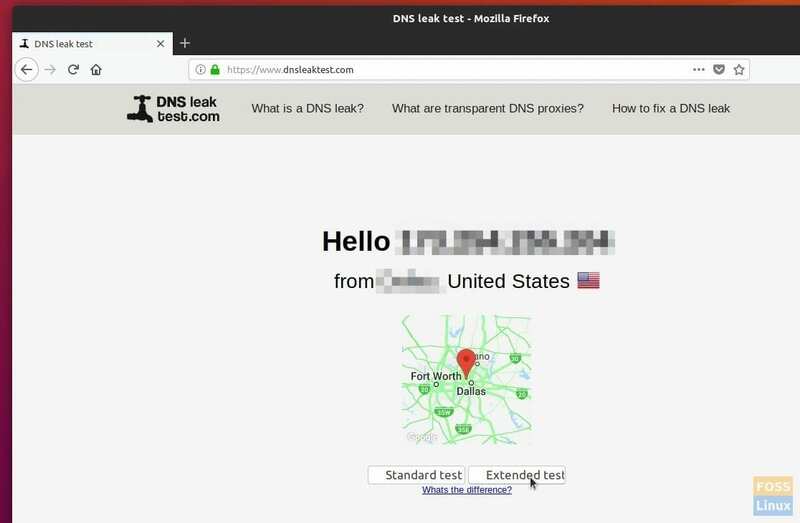 A DNS leak indicates a security flaw that allows DNS requests to be revealed to internet service provider’s DNS servers, notwithstanding the VPN service to attempt to conceal them. In simple terms, it’s as good as not using a VPN service. It is a huge problem and must be addressed immediately if at all one is serious about hiding the identity. In a few seconds, you should see a report of the test which shows IP, Hostname, ISP, and Country. If you see your internet service provider name in the ISP section along with Hostname having your IP address, then it’s confirmed that your PC is leaking DNS! For example in my test PC (above screenshot) without the DNS fix, it was completely revealing my ISP and location though it is connected to the NordVPN service via OpenVPN. This guide is tested to be working 100% in Ubuntu 18.04 LTS but should work without any issues in Ubuntu 17.04, and derivatives like Linux Mint, and elementary OS too. Start with disconnecting the VPN and continue with Part 1 and Part 2 instructions. DNS encrypt Proxy is a powerful networking tool that helps in DNS traffic encryption and authentication. It supports DNS-over-HTTPS (DoH) and DNSCrypt. It can force outgoing connections to use TCP. Additionally, it can block malware and other unwanted content. It is compatible with all DNS services. Step 1) Launch ‘Terminal’. You can use Ctrl+Alt+T keyboard shortcut in Ubuntu. Step 3) Copy and paste the following commands in the terminal and press enter. Step 2) Next step is to make the Network Manager use the default settings for managing the resolv.conf file by editing the conf file. Proceed to copy and paste the below commands into the Terminal to edit the conf file. Step 3) You will see an editor in the Terminal. Carefully, use the arrow keys to navigate to the first line and then copy & paste the following line below the first line that says [main]. Step 4) While in the editor, press CTRL X to exit the editor. Enter ‘Y’ to save and then press Enter to overwrite the file. 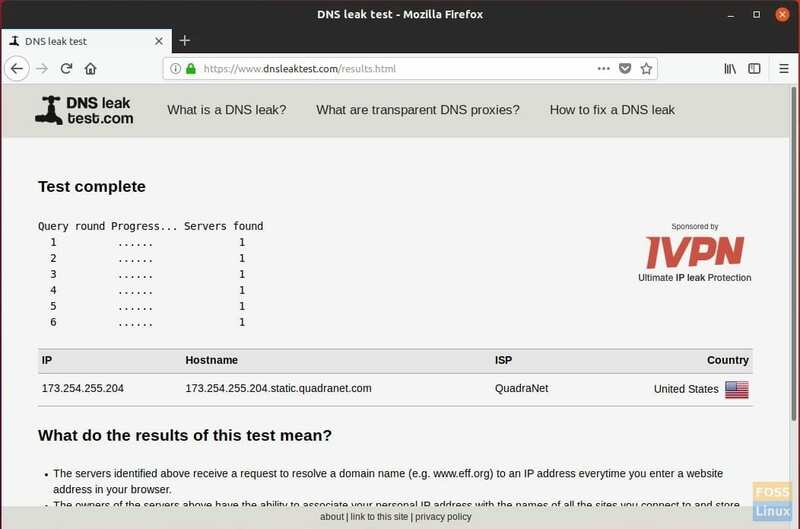 Step 6) Close all browsers, connect to your VPN service, and then go DNSleaktest page. 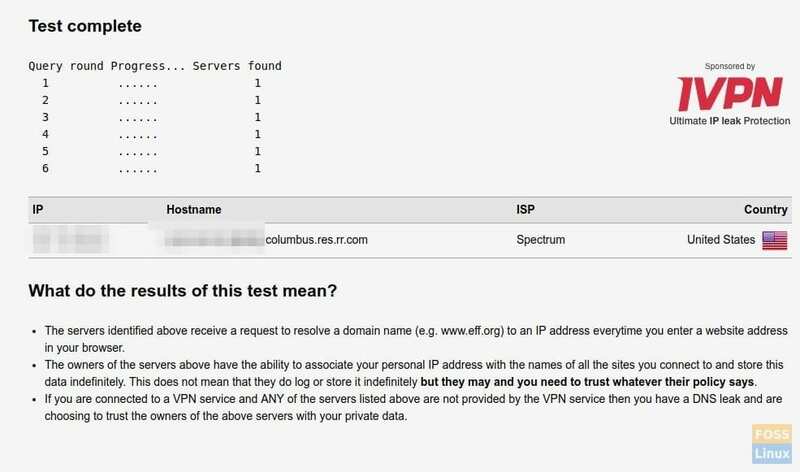 If everything went well, you should not see your ISP Name leaked in the new test. For example, my test PC connected to NordVPN server shows QuadraNet ISP which is different from my actual provider (Spectrum). Some users have experienced a loss of internet after the change in settings. Try the following to completely remove resolvconf. It looks like the default DNS is getting misconfigured. Thanks to BananaSam (in the comment below) for providing the link. 2. Enter the following command and hit enter. 4. Press Ctrl X and then enter Y to save the file. That’s it! How did the tutorial work for you? Do let us know your feedback in the comments below. I am unable to use internet after this, What Can i do to fix it ? Which version of Ubuntu are you using? Try restarting the PC and connect to the internet again. I have the same issue I have an internet connection but the connect icon is outlined in red and unclickable post using this tutorial. I have since tried reverting the changes and uninstalling dnscrypt proxy to no avail. I have no internet after following these steps exactly. No internet after rebooting, no internet after reversing steps and rebooting again. Please update this article; I think it’s doing more harm than good. Okay, I think I found a fix. I tried a lot of other things too, including undoing the above, so it might not be the whole fix. Basically use method 2 in https://ubuntuforums.org/showthread.php?t=2358660 . In case the link goes down, it involves changing “#DNS” to “DNS=8.8.8.8” in “/etc/systemd/resolved.conf”. Thanks for the link. I have updated the article. I forgot my OS is Ubuntu 18.10. Thanks a lot, I am using OpenVPN to connect to Nord on Linux Mint, and there was DNS leak using that method, (unlike connecting through terminal using Nord’s app). Your article fixed that. Fixed internet issue, and found another solution using ‘openresolv’. Background: I’m using a NordVPN .ovpn file to connect via VPN and I was getting DNS leaks on Ubuntu 18.04. I tried the ‘openresolv’ solution and my DNS/internet died. Also I’m an Ubuntu and vpn noob. I then restarted my PC. No restart needed fortunately, and I was alreadly VPNed in. Corrections (I was a bit excited and rushed): the ‘resolvconf’ solution killed my DNS/internet for some reason. A tip. Make sure you have downloaded the openresolv file and placed it into an accessible folder, prior making the changes so you have access to it for a clean re-installation should your network connection fail. Then you can go to the folder you saved openresolv within and run sudo apt install resolvconf from a Terminal to restore your network connection without dramas. My internet got killed even after attempting the ‘fix’ mentioned in the article. It only got fixed after I removed resolvconf using ‘sudo apt autoremove resolvconf’. But the strange thing is there was no more DNS leaking. Oh well, I will take it. Having gone through all of these instructions, I find these as with all other supposed solutions to Linux inability to effectively stop DNS Leaks, are a smoke screen. Designed to frustrate Linux users and drive them back to Windows and Apple. Shame on you. I am unable to connect to the internet even after following the suggested edits at the end of the tutorial. Can you please take this offline to prevent further damage?